Getting there: We started our hike along Bull Creek's southern half, on Lakewood Drive. From north Austin head south on Capital of Texas Highway (Loop 360) and turn left at Lakewood. If you get to 2222 you've gone too far. From the south, get ready to turn right after passing 2222. Parking is available just off of 360, next to the old pool. 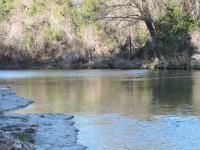 The Hike: The Bull Creek Foundation calls Bull Creek the Galapagos of Texas. In many ways they are quite right. The watershed provides sights and experiences that seem to contradict the fact that much of its length is shadowed by a busy highway and growing communities and businesses. The contrast of city encroachment and nature can be felt at the very beginning of the hike. We start at the waypoint marked "Trailhead", next to what was once a natural swimming pool made possible by dams across the creek. Intense flooding of the creek long ago proved that attempting to pacify the creek was a losing battle. Remnants of the the dam near the Lakewood Drive low water crossing remain as do the stone and concrete walls that line the pool area that remains today. There is a small waterfall here and it is one of the three popular swimming holes along the route of Bull Creek. The swimming area near the Bull Creek Trailhead. Our path leads north and the first of many creek crossings. 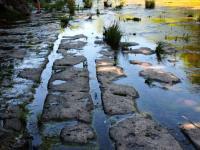 Depending on the time of year you take this journey the crossings vary from simple hops over a trickling stream to wading up to one's knees to get across. Due to a wet month prior to our hike the conditions warranted the removal of shoes for the crossing. A rock outcropping at the top of the first falls makes crossing relatively easy. Most of the creek bottom here is solid rock with only a few groupings of rocks able to withstand the quick flow of water. Lower Bull Creek Falls. Note the creek crossing in the background. A four way stop at the waypoint "Four Way" provides some options. 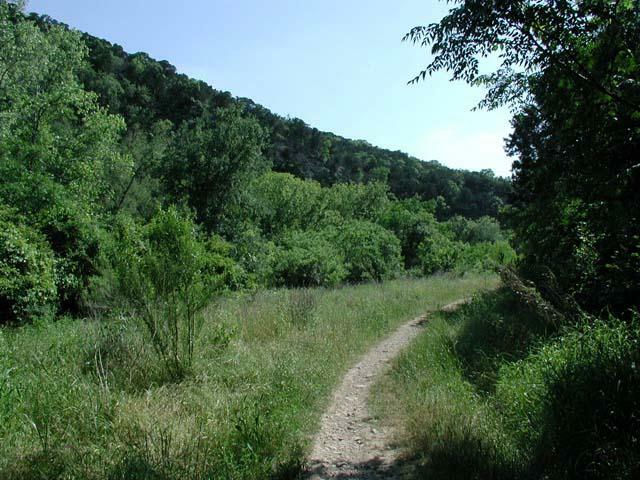 Numerous side trails exist in the Bull Creek area. For our purposes a general rule holds - follow the flow of the creek. In this case that means turning left and continuing north. A general rule of thumb concerning crowds is that they get less common the further away from parking lots one gets. The waypoint marked "Dam" bears this out. This man made waterfall can often be found with sun bathers and swimmers around it, but in less an abundance to the main three that we'll refer to as lower (near "Trailhead"), middle and upper. Some sections of the popular Bull Creek trail remain uncrowded. 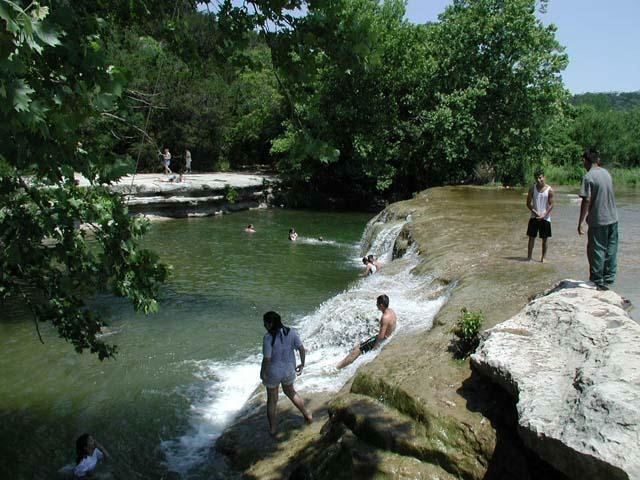 An example of a more crowded swimming hole is the waypoint "Middle Falls". A parking lot resides on the rock cliff that lines the creek in this area and that means easy access to the falls and the swimming hole beneath it. The trail on this side of the creek sits atop a rocky ledge overlooking the stream. 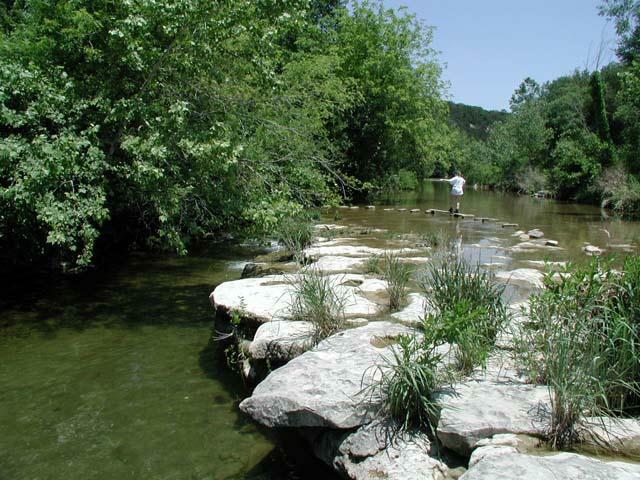 The ledge's height above the creek gives evidence of the wildly varying water levels that Bull Creek experiences. The rock surface is shaped in the wavy pattern of the water than has flowed over it for eons during wetter periods. On our initial trip north we had to make two creek crossing in quick succession just north of Middle Falls at waypoints "Crossing2" and "Crossing3". The level of the water and layout of the land was just sufficient enough to warrant the removal of boots once again, something we'll get used to before the end of the day. On the return trip we notice that it was possible to remain on the eastern side of the creek and pass under 360 just on the edge of the sloped concrete support of its bridge over the trail. This portion of the trail is not very well defined, so you might have to look carefully for it if you want to avoid the two water crossings. 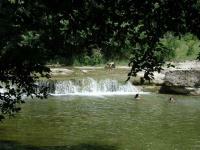 Main Falls provides the best swimming hole along the trail and wading opportunities to cool your heals. The trail becomes a bit less crowded at this point up through the waypoint "Side Falls". An angled rock ledge stands in the way of the creek at this point and the lowest point is on the far side of the bank. There are a couple of nice features about this location. Not being adjacent to a parking lot means fewer people, particularly folks who like to play their car stereos loudly while they swim. The site is also directly opposite from the Bull Creek Nature Preserve, marked on the map by a "Nature Preserve" waypoint. Please note that the rules that apply for the nature preserve (hours of operation, dogs and bikes) differ from those of Bull Creek Park. Visitors to the nature preserve are allowed, but failure to adhere to its special rules could jeopardize its goals. 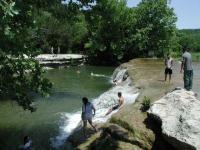 Coppertone crosses Bull Creek at Side Falls to explore the nature preserve on the opposite bank. The trail at the waypoint "Upper Falls" comes into contact again with a road and parking, which means people. Upper Falls is one of the two most busy areas of the trail. The falls here are magnificent and the pool at the base of the falls is probably the most popular swimming hole on the entire creek. There is a restroom next to the parking lot. 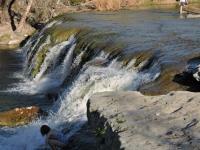 The top of the falls consist of a wide rock bed over which the creek flows. 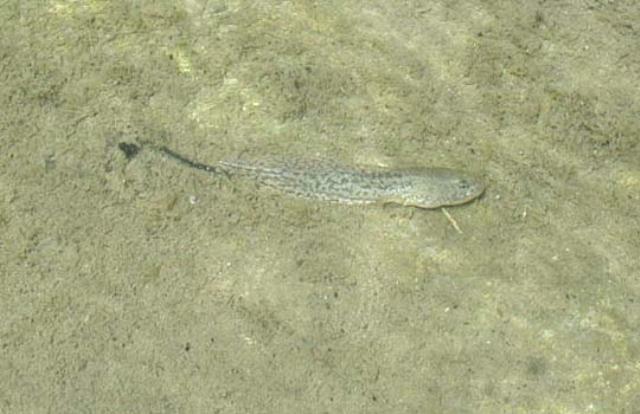 The shallows here are a popular wading area, though wading can be avoided. For our trip north we cooled our feet by wading the distance from the upper falls to the other side of 360. 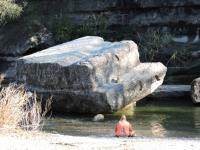 The rock here is largely bare, but sometimes slippery, so take your time. While wading this portion of the trail you might be afforded the opportunity to see some of the creatures that call the creek home, opportunities that are not as easily afforded on many other hikes. Very small fish are common here, but more interesting are the crawfish that live along the banks. On this trip we also were lucky enough to spy a salamander in the stream, a sight we had not seen in these waters before. When swimming or wading in our waters please be considerate of the wildlife who call the waters home, like this salamander. On the right as we head north we are provided with a beautiful view of a shear cliff to our right. On the topo map you can see this as very close contour lines. The hike along Bull Creek follows close to the creek itself, so the lofty surroundings do not add to the difficulty of the hike. At the waypoint "Trail Right" the main trail is the right fork in the road. However, if you have some extra time you should head left for an interesting side journey. 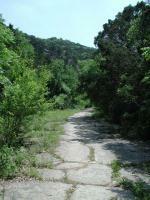 The side trail is largely solid rock, the top of the rock cliff that overlooks Bull Creek below it. That trail leads to the "Hidden Falls" waypoint, but then so does the main trail, so the option to take the detour is up to you. Bed rock trails and soaring cliffs are some of the features offered along Bull Creek. Before getting to Hidden Falls there is yet another creek crossing. 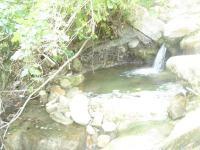 This one includes numerous rocks in the stream that provide just enough footing to avoid having to wade. A walking stick certainly comes in handy in helping maintain balance at such crossings. Hidden Falls is a nice little swimming hole and water fall in a fairly well wooded area, so it does not provide as wide a vista for viewing it as some of the other falls. During our trip only one family was swimming at the falls and they were in the process of leaving when we arrived. So these falls provide more solitude and quiet contemplation than the others. Hidden Falls provide the most tranquil falls along Bull Creek. 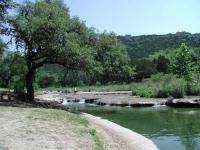 The remaining trail up to the final waypoint marked "Turnaround" continues north, even when Bull Creek itself heads east and crosses Loop 360. 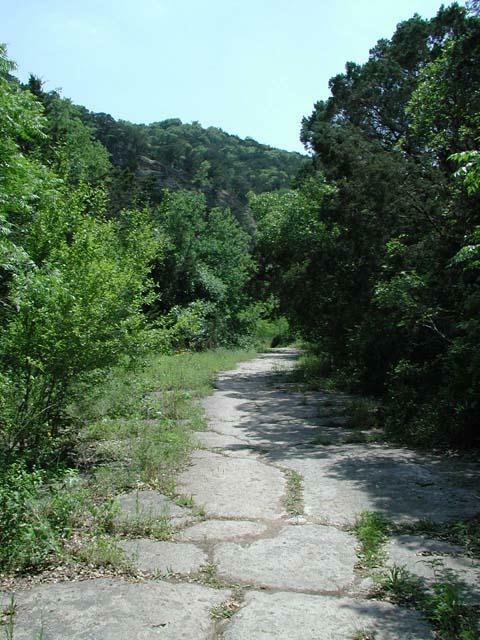 The trail ends at a small parking area along Old Spicewood Springs Road. Nearby a small falls exists in a heavily wooded depression. Being only a small tributary to Bull Creek the water flows along the surface of the rock more than it falls to the stream below. In all we took 5 hours to complete the hike out and back. However, the times can be misleading. Our initial hike up included more stops for observation, a bit of a detour into the nature preserve and more time spent wading across the creek. On the way back we avoided all possible wading, kept up a fairly constant pace and stayed on the main trail. The second half of the hike was accomplished in about an hour. 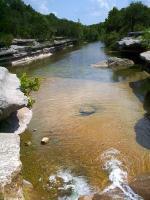 I have hiked Bull Creek probably a thousand times and have explored every inch off trail. When the park is empty is absolutely wonderfull. I try to make sure I go some time other than summer. Gorgeous scenery but hard to find the actual trail - not sure where to cross to the other side. Nice trail but lots of trash, unfortunately. 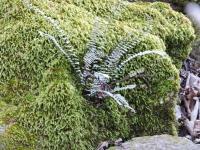 Challenging areas but beautiful views of water falls and creeks; some shady areas, average solitude. Very busy on this nice winter day. We hiked up one side and then down the other, but also ventured into the Preserve (halfway up on the west side you'll see the sign and it comes out by the parking lot by the low water crossing near 360, only accessible 8/1-2/28 each year). Nice waterfall too! More trash than I expected....picked up a couple of aluminum cans. Started at the tiny parking lot on Old Spicewood Springs Rd. (were the bathrooms are) and went down all the way to the Lakewood trailhead and back. 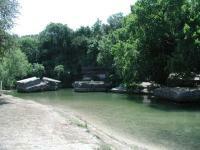 I love Bull Creek even though it looks truly awful. I would love to be part of a group to clean this park up. My wife brought a bag and we picked up a huge bag of trash. We hiked from the south (Lakewood/360 lot) on the west side and did the loop slightly up Jester and back down.